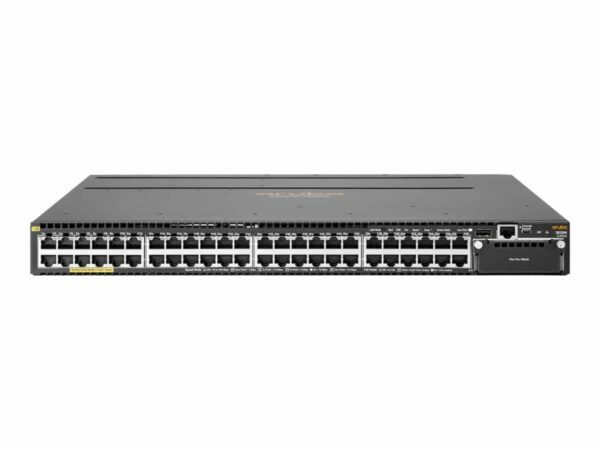 The Aruba 3810 Switch Series by Hewlett Packard Enterprise provides performance and resiliency for enterprises, SMBs, and branch office networks.The Aruba 3810 Switch Series supports security tools like Aruba ClearPass Policy Manager, Aruba Airwave and Aruba Central which provides optimal configuration automatically when connected to Aruba access points for PoE priority, VLAN configuration, and rogue AP containment. The Aruba 3810 Switch Series enables perfect mobile campus with SDN optimizations with low latency and adaptive power consumption and designed to deliver high-performance stacking with up to 336 Gb/s of stacking throughput and increased resiliency. The Aruba 3810 Switch Series with HPE Smart Rate multi-gigabit ports for high speed 802.11ac devices support multi-gigabit Ethernet on existing cabling provides cost-effective, convenient network and replace of cabling. The Aruba 3810 Switch Series comes with security tools like Aruba ClearPass Policy Manager, Aruba Airwave and Aruba Central which provides optimal configuration automatically when connected to Aruba access points for PoE priority, VLAN configuration, and rogue AP containment. The Aruba 3810 Switch Series supports enhanced security and policy-driven application authentication with concurrent 802.1X, MAC and Web Authentication modes for improved security and control change management access. The Aruba 3810 Switch Series supports Aruba ClearPass Policy Manager to provide unified and consistent policy between wired and wireless users. Simplified implementation and management of guest login, user on boarding, network access, security, QoS, and other network policies on the network.